Kentucky Bigfoot is in the middle of a media blitz. It is well deserved, we know this because we have been fans for a long time (You can read our complete Kentucky Bigfoot coverage). Charlie Raymond and Parker Duvall do some of the most thorough research available. 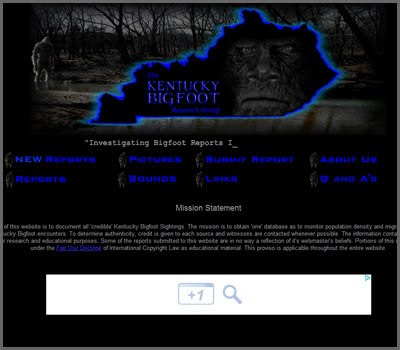 Don't take our word for it, check out Kentucky Bigfoot's Reports. Below is a video clip from Kentucky local TV Station WHAS11 followed by the written editorial from the WHAS11's website. LOUISVILLE, Ky. (WHAS11)- Whether you call it a Yeti, Sasquatch or Bigfoot, it is Parker Duvall's mission to find one. Duval is with the group Kentuckybigfoot.com. They head up investigations around possible sightings, and say they have documented about 200 cases throughout the state, but they do it with a critical eye. “When in doubt we throw it out. We've thrown out a lot of prints that we think are from this animal, but it's not definite enough for the general public to accept it,” Duvall said. The group is getting international attention with features on BBC and the History Channel's "Only in America" with Larry the Cable Guy. The shows were filmed just off highway 44 near the Jefferson-Bullitt County line, the scene of a recent sighting by a mother and daughter. “They was looking this direction and from this burm to these woods, a tall upright figure on two legs, with severe arm swing, turned and looked and went into these woods here,” Duvall said. Duval was not always convinced Bigfoot existed but after three years of acquiring footprints, hair strands and seeing territorial markings he is now a believer. Even more convincing was the first Bigfoot howl he heard. “The fight or flight is instant. You jump out of your shoes and you just want to run. Unfortunately I did that. We don't do that anymore, but I did that night,” Duvall said. Duval said they take the audio recordings to an expert who can validate sounds from all known animals in North America, but he said there is no match for the recordings they have made in the woods. Whether you believe or not, Duvall says it is only a matter of time before the truth is out. Until then, he encourages people not to be afraid to share their stories.